This surprisingly spacious and beautifully appointed cottage has been loving updated by the present owners and is situated in the heart of this popular village. This home offers two reception rooms, quality refitted kitchen and three bedrooms plus luxury family bathroom on the first floor. An additional loft room provides even more flexible space and the lovely secluded garden is ideal for relaxing. There is a small garage to the front, on street parking and store to rear via the secure entry. General Information - Thringstone is a popular and well served village in North-West Leicestershire and has a primary school, numerous shops and pubs and easy access o further facilities in nearby Whitwick and Coalville. The village is well placed for commuter access and lies within the English National Forest area on the edge of the renowned Charnwood Forest. Epc Rating - The property's EPC was carried out in 2010 and carries a rating of E. A full copy of the report can be found at: www.epcregister.com by using the property's postcode. Improvements may have been made since this date which could improve the property's rating and efficiency. Frontage - The property abuts directly to the pavement at the front with a pleasant view across the green and a secure gated entrywide to the right hand side of the cottage proving an access leading to the rear which is shared by two adjacent dwellings. Kitchen - 5.42m x 2.85m max (17'9" x 9'4" max) - With stable door to rear, underfloor heating with thermostat and fitted with an attractive range of shaker style units with contrasting dark granite worktops and under-cut Belfast sink. Space for American style fridge freezer and dishwasher plus in-built dual oven/grill, five ring gas hob and wine rack. uPVC window and Velux skylight. Utility/Cloakroom - With stacked space for washer and dryer, provides cloaks and general storage with wall light. Garage - 3.24m x 2.82m (10'8" x 9'3") - Braced timber double doors with glazed panels to the property's front elevation and wall mounted consumer unit. Lighting and power points. Lounge - 3.67m x 3.39m (12'0" x 11'1") - Feature fireplace/Chimney breast with tiled hearth and Oak mantle beam, coved ceiling with down-lights, picture rail, wall light points and Georgian style fan-light door with adjacent uPVC window. Ground Floor Wc - With sensor activated light and two piece suite comprising WC and wall mounted washbasin and Minton-style geometric pattern splash-back which matches the tiled floor. Down-lights to the ceiling, underfloor heating with digital thermostat and uPVC window. Landing - With internal high level windows for borrowed light and down-lights and smoke alarm, side landing accessing bedroom three with staircase leading up to the second floor loft room. Master Bedroom - 3.81m x 3.34m (12'6" x 10'11") - With radiator, uPVC window to the property's front elevation, picture rail, coved ceiling with light point. Bedroom Two - 3.83m x 3.40m maximum (12'7" x 11'2" maximum) - With laminate floor, ceiling coving and light point, dado rail, radiator and uPVC window to the property's rear garden. Bathroom - 2.48m x 3.64m max (8'2" x 11'11" max) - Recess with tiled shower area and Mira sport electric shower, sensor activated down-lights and extractor fan, WC with high level cistern, freestanding claw footed bath with central mixer and hand-shower, towel rail/radiator and vanity wash-basin with storage beneath. uPVC window and tiled floor. 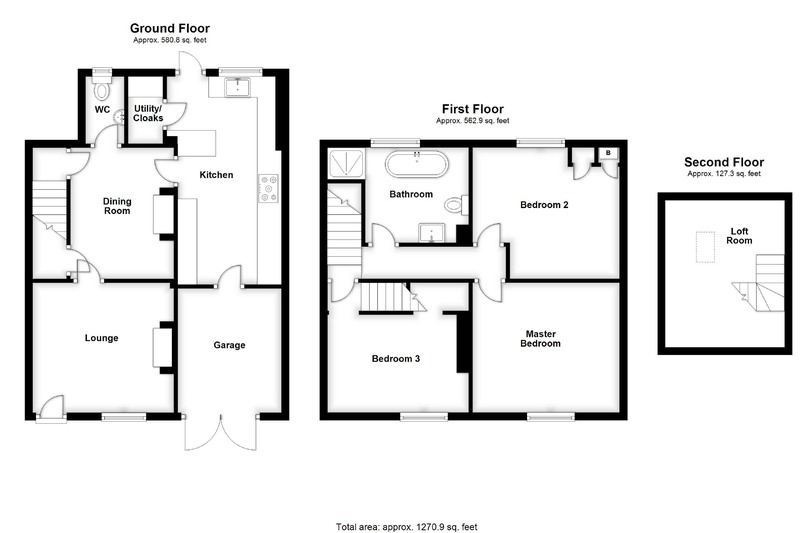 Bedroom Three - 3.67m x 2.56 max (12'0" x 8'5" max) - With cast-iron fireplace to the chimney breast, radiator, picture rail and light point, under-stairs recess for wardrobe/storage and uPVC window to the property's front elevation. Loft Room - 4.00m x 3.20m max* (13'1" x 10'6" max *) - With central stairwell, power points, wall light point and skylight window to the property's rear. *Measurements are maximum with much of the room having reduced or greatly reduced ceiling height. Garden - With paved pathway to the property's immediate rear then picket fencing to the mainly lawned garden which has a raised decking area, brick built store and raised garden with railway sleepers, planting and fishpond at the foot of the plot (the pond is well screened and difficult for small children to access). Moore and York are an independent estate agent with a long standing reputation for quality service, customer care and above all, many decades of experience working in the Leicestershire market.